BOSTON—During last Sunday’s game against the Toronto Blue Jays, designated hitter David Ortiz was reportedly horrified by manager Terry Francona’s comment that the Red Sox’ bats were coming alive, which caused the panicked slugger to scream warnings and urge teammates to flee Fenway Park. "If the bats are suddenly alive, we better get out of here before they start swinging really hard at us," said a visibly distressed Ortiz, who cowered on top of the bench for most of the final five innings of Boston’s 8-1 win over the Blue Jays. "I don’t want to be hit with wood." "I hope that, if they come alive, they swing and miss like I do," Ortiz continued. Team sources confirmed that upon hearing the Red Sox’ bats were beginning to show signs of life, Ortiz displayed his intense fear by frantically scrambling around the dugout, strapping on a catcher’s mask for protection, attempting to hide under a pile of jackets, playing dead when the batboy walked by carrying the team’s bats, and pleading with first baseman Adrian Gonzalez to save him from the bats. Ortiz also told Red Sox players to avoid making any sudden movements, as it might provoke the team’s bats to attack. "The way we treat the bats, they will probably be mad at us," Ortiz said. "My job is to hit the bat against the ball sometimes. The bats might be extra mad at me. But I didn't mean to hurt any bats." "I’m sorry, bats. Please don’t kill me," Ortiz added. "I never wanted the bats to be in pain." As a peace offering, Ortiz reportedly tossed several adhesive bandages and a tube of antibiotic cream at the team's rack of baseball bats from a safe distance. However, when the bats noisily tumbled to the ground, the six-time All-Star dashed into the outfield and shrieked, "Help, they’re rolling after me." According to the Red Sox, Ortiz was constantly expressing concerns that the bats outnumbered the players and could smell their fear. 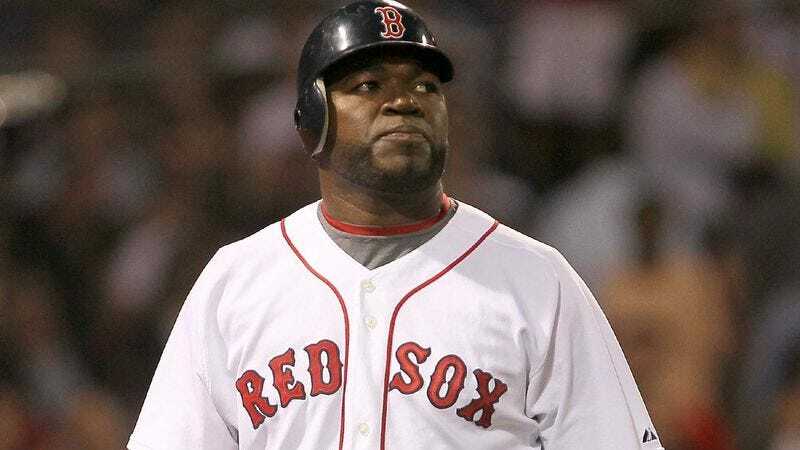 In addition, Ortiz reportedly worried that the team didn’t have the proper weapons to fight off the bats. "If we had matches, we could start the bats on fire. They’re made of wood and wood burns," Ortiz said. "Or if we had an axe we could chop down the bats. I don’t see any axes around here." "I don’t know if bats have mouths or teeth, but don’t let them bite you," Ortiz added. "I heard a bunch of times that you can get rabies from bats." Ortiz, who took precautions to avoid the bats at all costs, tried to abstain from playing in the game by quietly sitting in the corner of the Red Sox' bullpen, and attempted on several occasions to hide behind players in the Blue Jays' dugout. When Ortiz was discovered by Red Sox coaches shortly before his spot in the order came up, he arrived at the plate empty-handed and pretended to be holding a bat. "Evidently he doesn't remember the time last year when he heard someone say the Sox bats were cold, and he covered them with blankets and brought in sweaters and mittens for them," Red Sox batting coach Dave Magadan said. "This is the worst I’ve ever seen him. It was annoying last month when he heard that Carl Crawford had a Gold Glove and started digging up the field, but at least he wasn’t shrieking in fear the whole time." Team sources confirmed Ortiz became increasingly frightened and distressed as the game went on, eventually becoming convinced that, if the Red Sox' bats could come alive, other equipment such as balls, mitts, hats, and bases could become animated as well. "Maybe balls don't like to be thrown really fast," Ortiz said. "Or hit far away into stands filled with people they don't know. And I hate having to catch balls, so I think, wouldn’t a mitt hate that, too? And hats—would you want someone putting their head inside of you? That feels bad." "Bases are probably super mad, because I step on them pretty hard with my spiky shoes," Ortiz added. "Also, I see some people not stepping on the foul lines. Are foul lines the meanest thing? I guess they’re long. So maybe they could jump up and wrap around your neck and choke you." Evidently overcome with fear and remorse, Ortiz then spent an hour apologizing for stepping on carpeting, dirt, stairs, grass, cement, and the insides of his shoes. Ortiz said he briefly considered blockading the doors of the Red Sox' clubhouse with chairs and desks to prevent the balls, mitts, and bases from getting him, but realized that would leave him trapped inside with the angry pieces of furniture. Ortiz then began to quickly disrobe, claiming he wanted to be prepared if his uniform suddenly became sentient. "I don’t like all this stuff coming alive; it’s too scary," said Ortiz, removing a last sock and standing completely naked in the middle of Fenway Park. "What’s next? Trees? Or Red Sox fans? Or Dustin Pedroia?"